It is still summer time and who wants to buy a snow blower now or even think about the cold winter months that are just around the corner. However for some people it might be the best time, if you can take advantage of an early sale of last years models or machines that are this year and the vendor wants to move some of their product early in the year! With today’s economy, the stores such as Home Depot, Walmart and many others are motivated to improve their sales figures and move product. This could be the time to take advantage of sales they have or even strike a bargain with them and get ten or fifteen percent off. The best time of course is in the spring at the end of the season, however if you missed that opportunity, then the next best time is probably right now to take advantage of an early sale. Even though you may be able to take advantage of a sale for a snow blower, it is still important to figure out exactly what you need and want in a snow blower. There are lots of features, sizes and engine power to select from and since you will have it for some time, you want to make sure you purchase the best machine that will meet your needs. For most people the most important items will be the size of the clearance width and the engine power. You want a large enough machine so that you can clear snow quickly. However if you have a small driveway, then there is no sense in spending a lot of money on a large snow blower. Remember that you have to store it somewhere in your garage or shed. You do not want to leave it outside all year long if you can help it. Features such as lights, one hand operation, electric start and chains are all considerations, which add to the price and may be needed if you have the conditions that warrant these features. Figure out what you need and then look for a snow machine that meets your needs in the price zone that you are comfortable with. We were just at one of the big box stores the other day and they have all of their snow blowers out on display. Costco also has snow blowers available. Check out the prices before the season starts and you may be able to fond deals that save you a lot of money. If you see deals at one of the big box chains, please let our readers know on this blog so that we can all save some money. Also just to let you know that if there are spam comments, we will delete those comments. Place a link to our page on your web site back to ours. We will be happy to do the same. 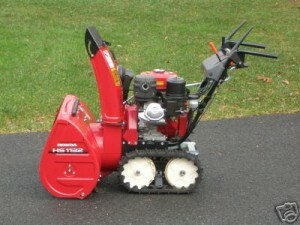 we are looking for a new snow blower for this coming winter and found your post very helpful. We have not decided yet if we will go for a large blower or a smaller one that is easy to store in the garage. there are lots of sales for snow blowers on right now so now is the time to buy.